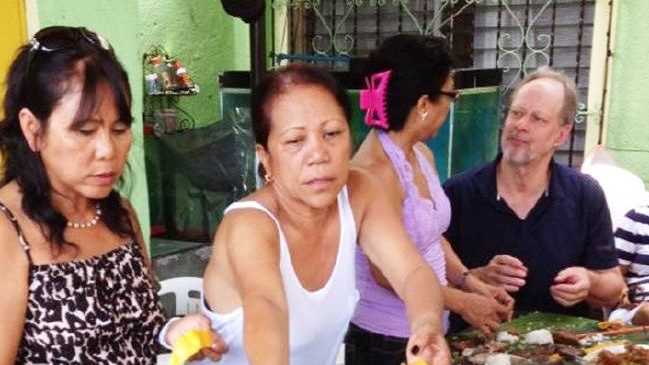 Image of Las vegas shooter Stephen Paddock (right, black shirt) sharing a meal with Marilou Danley's family in Manilla in 2013. A FORMER Gold Coast woman who was reportedly the girlfriend of mass-murderer Stephen Paddock is the potential key to unlocking why he staged an horrific long-ranged sniper attack on a concert crowd from a high-rise Las Vegas casino. Las Vegas shooting: inside room: First look inside hotel room where shooter fired. Australian citizen Marilou Danley, 62, was in Japan when Paddock filled his 32nd floor suite of the Mandalay Bay casino with 19 high-powered guns, including assault rifles with scopes, and fired on the crowd below, killing at least 59 concertgoers and injuring more than 500. Paddock's motive for the worst shooting spree in modern American history remains unclear, but authorities hope Ms Danley could have some answers. Ms Danley's social media sites showed she was a regular world traveller who described herself on her now-deleted Facebook profile as a "proud mom and grandma who lives life to the fullest".